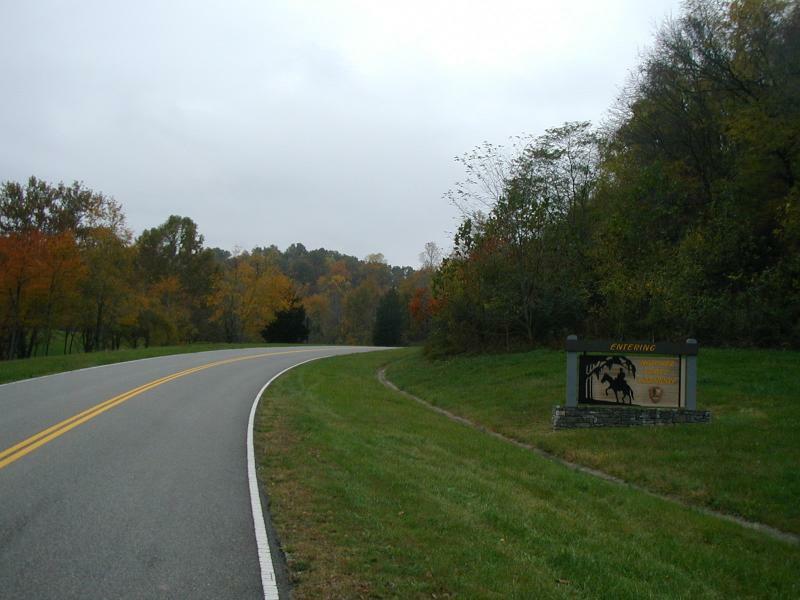 On October 29th, 2002 I flew to Nashville, Tennessee for a fall ride along the Natchez Trace Parkway. 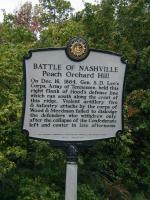 The Parkway goes for 450 miles from Natchez, Mississippi to Nashville. It is a historic and scenic route that doesn't allow commercial traffic and bypasses large cities. 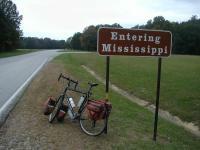 As such it is a popular cycle touring route in the southeast USA. Picture at left is $14 million bridge over Tennessee highway 96. Locals refer to this as the "McDonalds bridge" due to the twin arches. (I didn't cycle over this bridge, but instead visited on my drive back). Photo at right shows some of the nice fall colors. Crunch, crunch, crunch. Light snow and fifteen degrees as I walk my bicycle in early morning light to the airport shuttle. Roads have become less icy since last night. 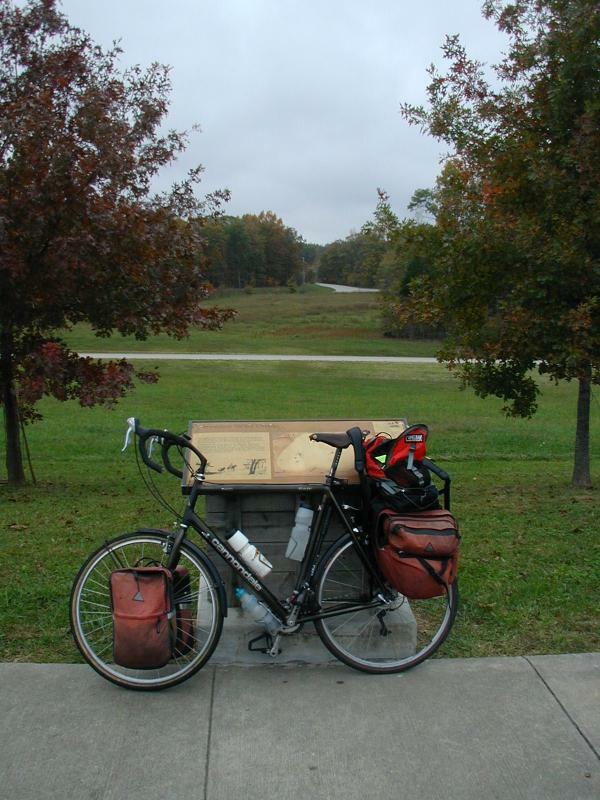 I'm headed to what I hope is warmer climate in Nashville and chance to ride the Natchez Trace Parkway. 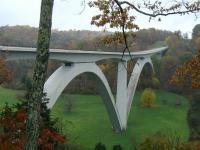 The Natchez Trace goes 450 miles from Natchez, MS to Nashville, TN. 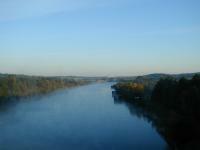 The route has a long history as a route for animals, indians, explorers, settlers and other travelers. One of the best known was a period just prior to steamboats. Farmers in Tennessee or Kentucky would build flatboats and float their wares down Cumberland, Tennessee and Mississippi rivers. 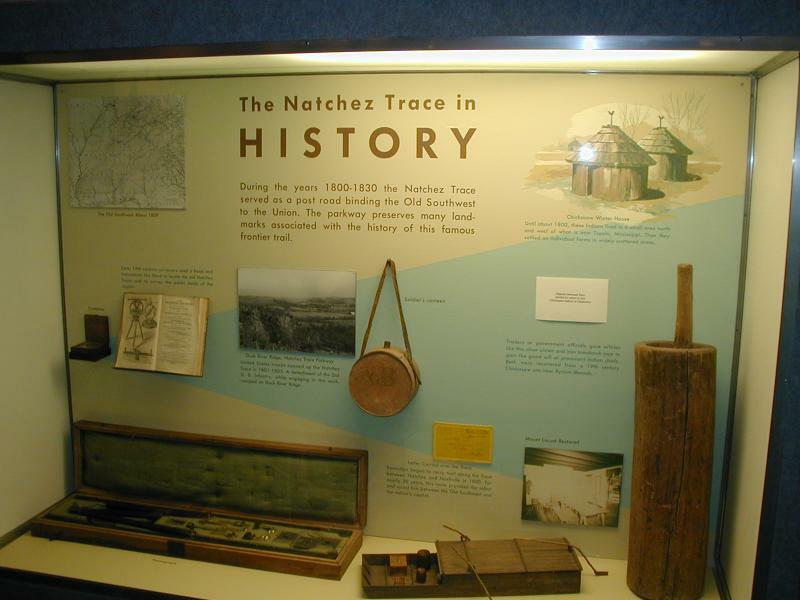 Here goods and boats would be sold and farmer would then walk back along the most direct route...the Natchez Trace. I had read some about the trace, but there was more history, fall colors and places to explore in person. Airline fares and schedules led me to plan my ride "backwards" and also to stop at Jackson instead of going all the way to the Mississippi River. Uneventful travels by bus and plane, though the bus driver decided to pack heavy suitcases on top of my bike box. It was enough crushed, ripped that I ended up getting a new box. Fortunately bike looked to be ok. I assembled my bike, asked directions and by 2:30pm I was riding out from the airport. I followed the ring road (255/Donelson Pike) around and through some small rolling hills as I pedaled 11 miles around and past I-65, passing a Dell plant and many apartments along the way. Four lane traffic with 12 inch shoulders, but most drivers were well behaved. 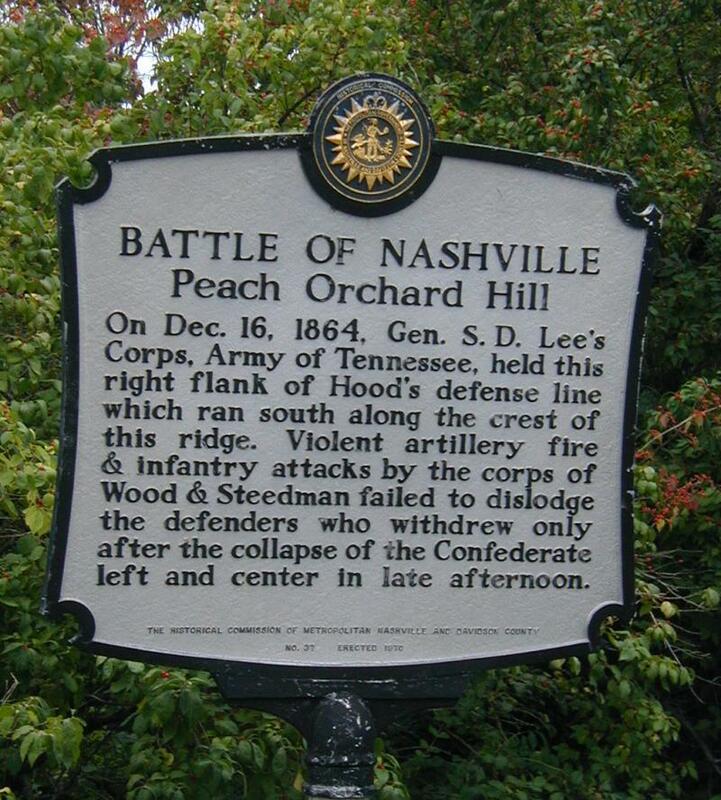 After I-65, I turned south on US 31 which parallels the interstate through Brentwood to Franklin. I was amazed at sizes of churches here. A lot of $ to build some giant buildings here. A few more bouncing hills and I was in middle of Franklin. I asked directions and found my way to motel district by the interstate, arriving just before dark. It had been dry, dreary overcast and I was glad to have a warm room. They even gave me a senior discount! (They say by accident, they meant AAA discount). Had dinner at Shoneys across the street and remarked to the waitress that there seemed to be a Shoneys at every exit. She laughed at me and drawled, "you're in the south now, with good ole southern food". So I made sure to ask for ice tea "unsweet". Happy Halloween! Several houses elaborately decorated when I passed through Franklin this morning. It is also campaign season with many political signs in yards. However, I left behind both halloween and political decorations when I started on the Natchez Trace. 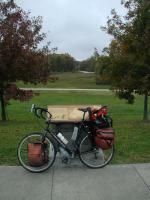 The parkway has no commercial establishments nor truck traffic nor traffic lights. Just miles of cycling through forests and along fields. When other roads are encountered, there is an overpass or underpass with an on/off ramp about every 10 miles or so. I had breakfast before I left and rode 3 miles back to Franklin. After asking directions, I followed 246 and Southall road to Leipers Fork at 11 miles. Here a stop at the market and then the on ramp to the parkway at mile marker 429. Yeah! 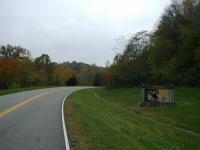 A few rolling hills and then a stop at mile marker 424 at the Tennessee Divide. Approximately 1000ft high, this ridge divided drainages of Tennessee and Cumberland Rivers. It also marked former boundary of Indian territory to south and US territory to north. From here a bit smoother to my next stop at 408 at Duck River. 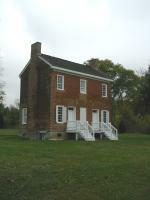 There was one of the first brick buildings and also site of a former ferry. After Duck River a few more rolling hills made for a good excuse to stop at an old tobacco shed at mile 401. Along the way were several signs for the old trace, mostly an overgrown path now. A long descent at 392, followed by gradual climb. The road also changed to a coarser chip seal. At mile 370 was an exit to US 64, and good excuse to stop for the day. West of the exit was a small market. Also here was Natchez Trace Motel. Parking lots were overgrown, restaurant was closed but fortunately a sign saying "go next door for a room". It was a bit of a fleabag motel but dry and warm, so glad to stop. Three states today as I cut off a corner of Alabama. I left just as it was getting light. At 45 degrees it was warmer than forecast, though still felt cool. There was a surprising amount of cars early, these were commuters not tourists. First six miles were mostly downhill but next six made up for this with a slow climb. I saw several deer with flashy white tails. They watched me approach and then quickly bounded away. At 15 miles was Collinwood and chance for breakfast. I stopped at Chad's Restaurant. A framed photograph proclaimed the Collinwood Trojan basketball team going 25-0 during 2000. Team uniforms, cheerleader outfit and a saddle completed the motif. A good breakfast (no grits) and I was on my way. From Collinwood some slight hills, followed by mostly downhill in next 10 miles. 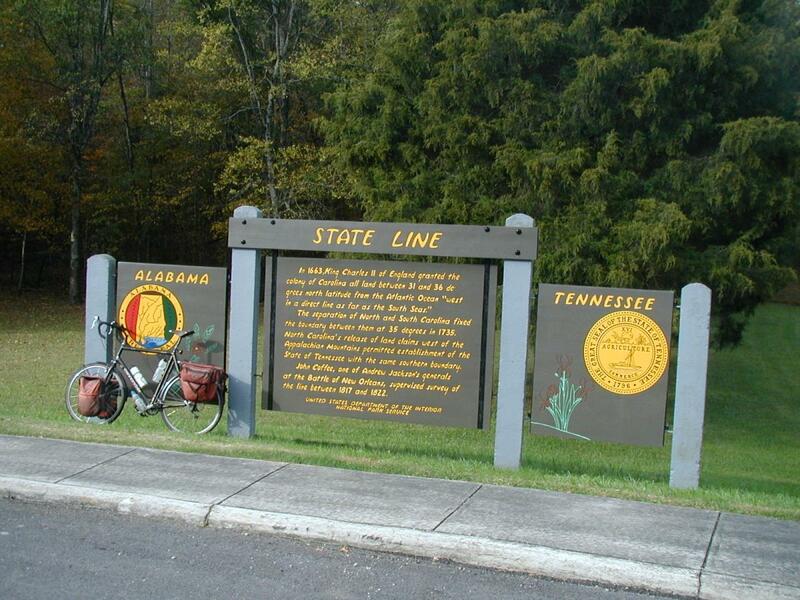 At 28 miles I came to Alabama border at 35 degrees north. Hooray! The road became a bit smoother. Instead of overpasses, most small cross roads intersected with the Trace. More descent than climb and at 42 miles I found myself at Pickwick Lake on the Tennessee River. The bridge was almost a mile long. The sun came out just enough to cast a shadow, but also a brisk cool wind. From here some more bouncing hills. At 44 miles I left the Natchez Trace Parkway to take detour through small town of Cherokee. First four miles were nice quiet county road, but then a busy four lane highway without good shoulders. I was happy to be back on the quiet Trace again. After Cherokee, the road climbed over a few more hills. At 63 miles another border as I crossed into Mississippi. Close to border was a old Indian burial mound over 8000 years old. Six miles later turnoff to MS 25. Yesterday I had made reservations at hotel in Belmont since the next place would be Tupelo, another 43 miles further. Belmont was seven miles south and nice small town with old hotel, a restaurant and a few shops. Some adventure today to keep things exciting. All started out normal enough with mostly clear skies, a pretty crescent moon and a chilly 35 degrees. Forecast called for rain tomorrow so I was out early with hope of making a long day today and shorter tomorrow. 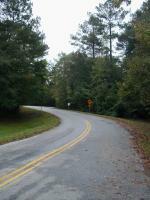 A few gentle hills and I turned left on MS 4 and then at eight miles I was back riding the Trace at mile marker 296. Some gentle hills but I was feeling strong. At mile 287 was Pharr Mounds, a sequence of eight old burial mounds up to ten feet high with interpretive display. A few cars stopped for the restroom. People in tiger striped clothes stepped out. The car also had decals. They were on their way to an Auburn football game. Over next twenty miles many other cars passed, some with "AU" stickers, flags or license plates. 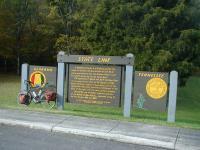 From the burial mounds I made good time and was at Natchez Trace Visitor Center shortly after 9am at mile 266. Nice interpretive displays and helpful staff. They suggested taking the road through Tupelo for breakfast and I made my way to McDonalds shortly after. They also suggested making motel reservations with football games afoot, so I called motel in Mathiston at mile 304. Roads through Tupelo were busy so I was happy to get into relative quiet of the Trace. Just before mile marker 240 my right pedal sheared off. I circled back and picked up the pedal. The metal had clearly broken off, leaving just 1/2 inch threaded into the pedal. Check the map. 25 miles back to Tupelo or 13 miles ahead to Houston or 36 to my motel. I decided to try for Houston. I found I could bike/glide downhill and some on the level. Gentle uphills were harder, so I sometimes walked. Without the toe clip on left pedal, it would have been impossible. It was still slow going though. To add insult to injury, it started to sprinkle lightly. I half-heartedly tried hitchhiking but nobody stopped and I kept going. In Houston I saw a motel and nearby a Walmart. Went in and found they had bike pedals... oops, they sell 1/2 pedals and I needed 9/16. I went back to motel, checked in and tried figuring out my alternatives. There is no bus service in town (nearest place is Tupelo). Tomorrow is Sunday and welding shops are closed. 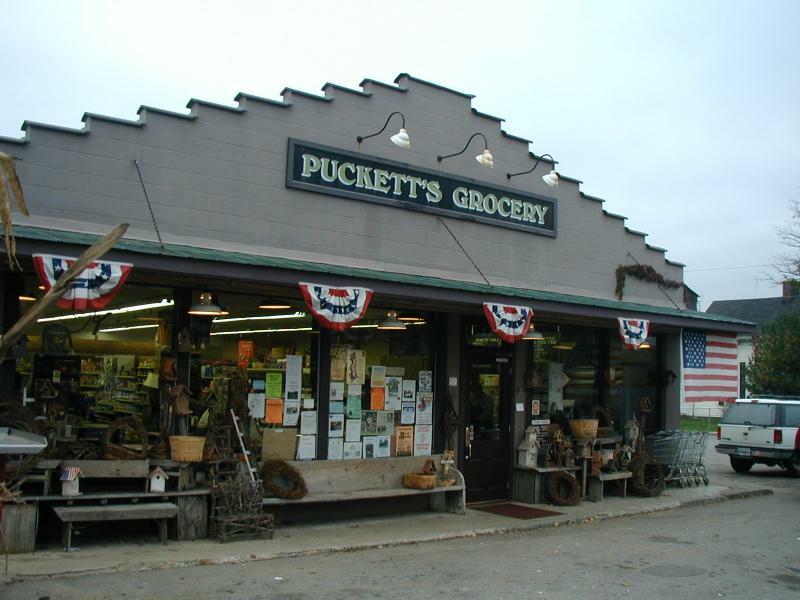 Nearest bike shops are Tupelo and Jackson (Kosciusko has a shop, but phone # is disconnected). Looks like I either had to jury rig something or at least get back to Tupelo. Went back to Walmart and browsed the aisles for something with 9/16th thread (fortunately the right pedal so normal threading). Found two things that might work... a spark plug and 1/4 gas line piping (with outside adapters). Bought them and threaded the gas line on the crank. At least it gives me 3 inches to rest my right foot. 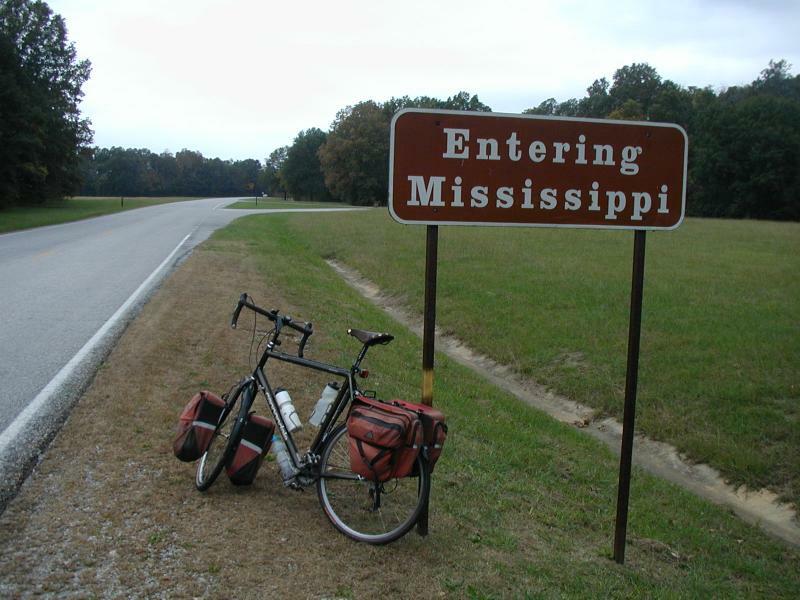 Depending on the rain and how well the spark plug or gas line works as replacement pedal, I'll try one of two alternatives tomorrow: (1) cycle two days to Jackson or (2) cycle back to Tupelo and take the bus to Jackson. Will see, always an adventure. 66 miles with two pedals and 13 miles with one pedal. A cool wet ride today as the storm came through. As I left, light sprinkles and mid 40s. In the first mile, the pipe fitting fell off twice, so I switched to the spark plug. That worked better, though didn't have much room for my foot to rest. Still quiet as I came through main square in town. It wasn't raining too hard, so thought I'd head towards Jackson instead of Tupelo. I had difficulty climbing hills with the spark plug, but fortunately gentle grades or flat today. At six miles I was back at the Trace. Sign said, "Tupelo 37, Jackson 135". One last time to decide and I headed south. It was quiet on the Trace. Mostly wooded with an occasional field. The rain sounded much louder falling through the trees than in open. At milepost 218 path became smoother. The rain kept me from stopping much though every few miles I would walk a short stretch since my left leg was otherwise getting tired. At milepost 203, road work ended and became much rougher. Several sites for historic inns or missions along the way. I would pause briefly, read the sign and continue. At mile 194 was Jeff Busby campground and small store. A wet dog was out begging though also skittish. More cars stopped here for restroom break. At mile 180 was French Camp with old historic houses. In this next stretch a pickup stopped and offered me a ride though I was geting close. At mile 170 light sprinkles turned to heavy rain. Squish, squish said my sneakers. It rained hard last 10 miles so I was happy to find motel at Kosiusko. Clothes by the fan drying. Pizza Hut nearby. Happy to have made it here today. Made it to Jackson. Last day cycling the Trace started at daybreak. Rain had stopped though there were still occasional puddles. The area has had above average precipitation lately, so excess can easily cause flooding. This stretch of the parkway was flattest. Very gentle up and down grades. Trees weren't turning colors yet. A few fields with cotton, a few cows but mostly long stretches of forest. Some was cypress in low swamps and some was dry pine. Spark plug was still working fine, though still had to walk occasionally. Stopped briefly at mile 140 at Red Dog Road, named for former Indian Chief. Came past several small turnoffs. At mile 123 was nice rest area on the Pearl River. A little later, came past shores of a lake. At mile marker 103, signs indicated a detour to I-55. I found a bike path along the way and got to Mississippi Craft center and end point for the Trace. Yeah! I asked a local for directions to a bike shop. After one wrong turn, found the Indian Hill Cycle shop. I purchased new pedals and asked for directions to the airport. Much easier cycling. Went back past the resevoir and then around airport. Even in time for my 3 pm rental car pickup. End of the line for now. Drove part of way back to Nashville and stopped for overnight in Cullen, Alabama. Back in Nashville and waiting for the plane. An uneventful trip back, though United didn't have boxes here. 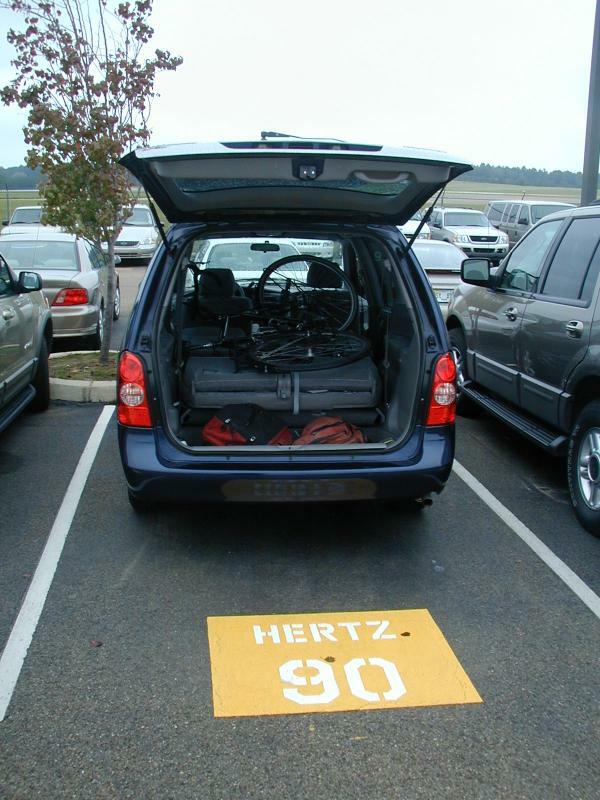 They eventually got one from Continental (at $20 instead of $10, ouch!). A few reflections on "the Trace". Roads in the south or east seem to be worse about shoulders than the north or west. While the NTP also doesn't have shoulders, it is still a welcome change since the scenic route has lower speed traffic, no commercial trucks and a more relaxed feel. The NTP avoids larger towns and bypasses the small towns. It is a limited access road with no businesses or houses directly connected. There are many miles of forested roads with deer, wild turkeys and other birds. Some farms with cotton, cattle and pastures. Lack of towns is mostly a good thing as it leads to more relaxed riding. Hence, this would be a good first tour. At the same time, one thing I enjoy is seeing local businesses and people to get a flavor of things. You need to get off the parkway to do this. If weather cooperates, this would have made a good camping trip. Multiple campgrounds and places to stop. Given the rain and cold, I was happy to have motels not too far apart. Grades on the NTP are mostly flat with slight hills further north. However, even compared with endpoints of Nashville or Jackson, nearby NTP is flatter. Many historic signs to stop at. Finally, the NTP isn't a good place to lose a pedal, at least not on a weekend. Had fun riding this section. Perhaps I'll connect further south with Natchez or even Baton Rouge.